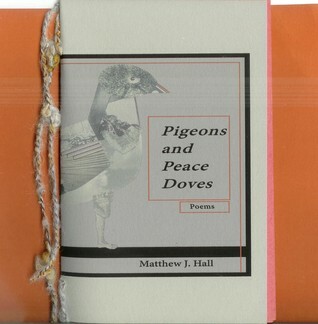 Pigeons and Peace Doves by Matthew J. Hall permits the reader to feel and experience contemporary life in a way that I have yet to come across. Within his poems one finds anger, mixed with tenderness, held together with despair and hope. He has a talent for finding substance and significance in the seemingly banal and overlooked, well demonstrated in the poem “Harbouring Thoughts of Escape” wherein the narrator walks along a river and contemplates throwing himself into the water just so “something will have happened today” and the problematic monotony of a painfully bland existence will be temporarily solved. On the surface such an act makes no sense, but for someone like myself who has suffered from excruciating boredom in conjunction with depression, it makes perfect sense. I also quite enjoyed the subtext throughout this book, exemplarily displayed in the poem “This City is Sad and Angry” where the narrator comes upon a crippled pigeon and wants “to make a lollipop-stick splint/ for his crippled leg” and asks his companion if he can keep him, to which is profoundly replied “sweetheart, you already have”. The following poem “The Full Weight of My Head” is perhaps my favourite in this small collection. I got chills from this one, when the narrator, after having “swallowed every damn tablet in the house” can’t bring himself to confess to his companion, “that love, even as purse as hers/ would never be enough”. On the surface this may seem depressing, and people who want flowery life is wonderful, everybody is happy messages shoved up their asses probably won’t relate to this, but if you’ve ever struggled to want to keep living, a book like this helps the journey.